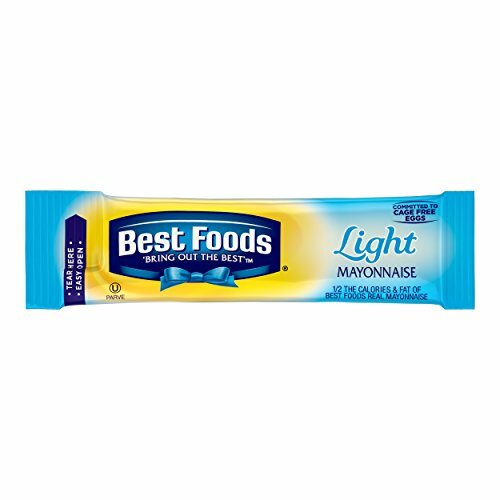 Best Foods Light Mayonnaise Stick Packets treat your health-conscious guests to a delicious condiment that won't disrupt their diet. This mayonnaise delivers the rich, creamy flavor of an ordinary mayo--but it contains only half the calories and fat. Ideal for cafes, restaurants, and catering services, the convenient packets allow guests to easily dispense mayonnaise and minimize mess and waste. This mayonnaise not only pairs perfectly with signature burgers and sandwiches, but it also can be used as a creamy dipping condiment. With its smooth mouth feel and balanced flavor, it is sure to impress even the most discerning palates.